The adrenal and thyroid connection is often missed by doctors checking only the thyroid. Understanding how these glands affect each other helps you address adrenal fatigue and hypothyroidism at the same time. 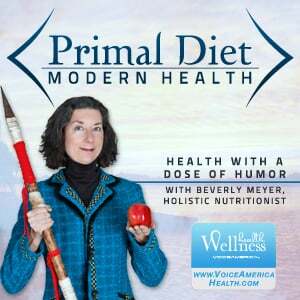 The goal of all natural health care is to resolve the cause of the problem, not just the symptom. If you’re treating your thyroid lab numbers but not checking adrenal function you may be missing something! The adrenals are small endocrine glands sitting on top of the kidneys. They produce a variety of hormones affecting neurotransmitters, other hormones, blood pressure, and ultimately all body processes. Chances are if you have adrenal fatigue you also have thyroid problems. What does the Thyroid Gland do and how does it relate to the Adrenals? The thyroid sits like a butterfly at the base of the throat. Like the adrenals, thyroid hormones affect every cell of the body. The thyroid in turn is affected by neurotransmitters, diet, toxicity from dental fillings, infection, lack of nutrients and more. The gland is frequently a target of auto-immune antibodies as Hashimoto’s or Graves Disease. (I used to have Graves but resolved it without medication or surgery). 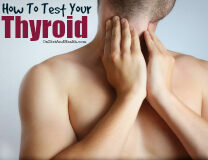 Thyroid hormones affect metabolism, hair, fertility, skin, heart rate, the bowels and much more. This article on Thyroid Toxins, Nutrients and Goitrogens may be useful. Imagine the adrenals as the engine of your car, and the thyroid as the accelerator pedal. If the engine is broken, you can press the accelerator all you want but you aren’t going anyw here. Likewise, if the accelerator is broken, the best engine in the world can’t respond. This creates a see-saw relationship between the thyroid and the adrenals. 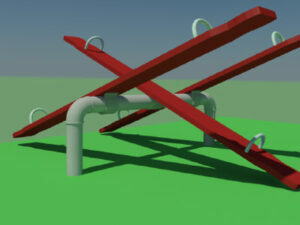 If one side is too high, it pushes the other side lower. If one side is too low, the other will raise up to compensate. This is the body’s wisdom to still give you energy but help you avoid burnout. Adrenal Fatigue and Thyroid Problems Can Be Linked. Treating Just the Thyroid Makes This Worse. I see many clients on thyroid medication who really have an ADRENAL problem, not a thyroid problem. One sure sign of this is when I hear “the thyroid meds worked great for a while but stopped working so I had to increase the dose”. What happened is that tired adrenals told your thyroid to SLOW DOWN because the engine (the adrenals) is in danger of burn-out. Thyroid metabolism then downregulates – the correct response while the body waits for you to get physical or emotional stress under control. By adding thyroid medication, you circumvent this feedback mechanism. Then the adrenals have to insist even more that the thyroid slow down. Thus, higher and higher doses of thyroid medication. The opposite can be true too. If your adrenals are cranked up and producing excess cortisol, your body will suppress the thyroid to protect your valuable adrenal engine from burnout. Neurotransmitters such as GABA and Serotonin help regulate all this too, and it is not uncommon to see my clients need GABA support to help regulate excess adrenaline, anxiety and stress. (While straight GABA is available in stores, it doesn’t work very well – I prefer Passion Flower as GABA support (here it is in alcohol or glycerite tincture in my store)). Passion Flower is incredibly useful for adrenal fatigue where you feel “wired” and can’t sleep well too. This is the brand I sell in my clinic and online store along with professional grade Chamomile Extract. Both are calming without being sedating. 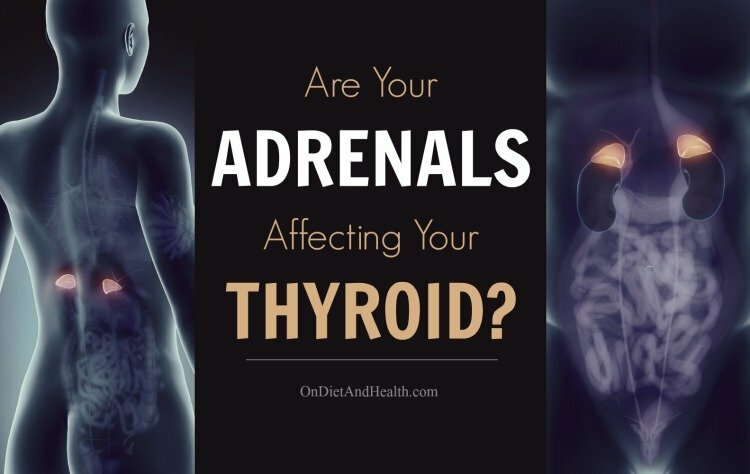 What happens when both the adrenals and thyroid become exhausted? If you have chronic adrenal fatigue, you will use more thyroid hormone to make up for the lack of Cortisol. This leads to thyroid fatigue! 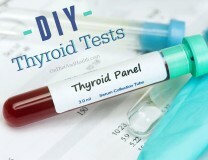 Test the adrenals before treating the thyroid — before starting thyroid hormone, take a cortisol saliva test which measures total daily cortisol and how it’s distributed over your day. This article has more on saliva testing. 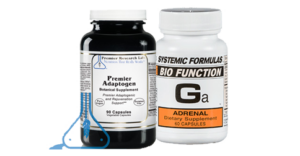 This article discusses supplements for the adrenals. On this Consult page I sell Saliva lab tests and a phone consult to review them. Very helpful! The two products shown here include my top-selling adrenal support product. I’ve carried it for decades in my clinic. It can help rebuild the adrenals and can be taken for many months. Or use as needed for fatigue. It makes you feel better but without stimulants. Take one daily at 3 PM to avoid the afternoon crash. This Adaptogenic herb shown with Ga-Adrenal helps the body deal with stress. Stress is what exhausts the adrenals. These herbs are very premium quality – much better than store-bought herbs sold by these names. Herbs have quality differences, just like pasture-raised meat vs. feedlot meat! Quality counts! Break the adrenal and thyroid connection and it’s easier to rebuild them both. The body WANTS to heal. You just have to stop stressing it….